Abstract: The eastern quarter of the Flagstaff 30′ x 60′ quadrangle includes eight USGS 1:24,000-scale quadrangles in Coconino County, northern Arizona (fig. 1, map sheet): Anderson Canyon, Babbitt Wash, Canyon Diablo, Grand Falls, Grand Falls SE, Grand Falls SW, Grand Falls NE, and Meteor Crater. The map is bounded by lat 35° to 35°30′ N. and long 111° to 111°15′ W. and is on the southern part of the Colorado Plateaus geologic province (herein Colorado Plateau). Elevations range from 4,320 ft (1,317 m) at the Little Colorado River in the northwest corner of the map area to about 6,832 ft (2,082 m) at the southwest corner of the map. 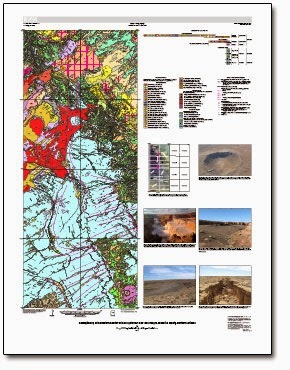 This geologic map provides an updated geologic framework for the eastern quarter of the Flagstaff 30′ x 60′ quadrangle and is adjacent to two other recent geologic maps, the Cameron and Winslow 30′ x 60′ quadrangles (Billingsley and others, 2007, 2013). This geologic map is the product of a cooperative effort between the U.S. Geological Survey (USGS) and the Navajo Nation. It provides geologic information for resource management officials of the U.S. Forest Service, the Arizona Game and Fish Department, and the Navajo Nation Reservation (herein the Navajo Nation). Funding for the map was provided by the USGS geologic mapping program, Reston, Virginia. Field work on the Navajo Nation was conducted under a permit from the Navajo Nation Minerals Department. Any persons wishing to conduct geologic investigations on the Navajo Nation must first apply for, and receive, a permit from the Navajo Nation Minerals Department, P.O. Box 1910, Window Rock, Arizona 86515, telephone (928) 871-6587.